Heat tortillas and taco shells as directed on package. In medium bowl, toss broccoli slaw mix, dressing and cilantro; set aside. In shallow dish, place taco seasoning. Coat both sides of fish with taco seasoning. In 12-inch nonstick skillet, heat oil over medium-high heat. Cook fish in oil 6 minutes, turning once, or until fish flakes easily with fork. Divide fish into 8 pieces. Spread each flour tortilla with 2 tablespoons guacamole. Place hard taco shell on center of flour tortilla. Using slotted spoon, spoon about 1/4 cup slaw into each hard taco shell. 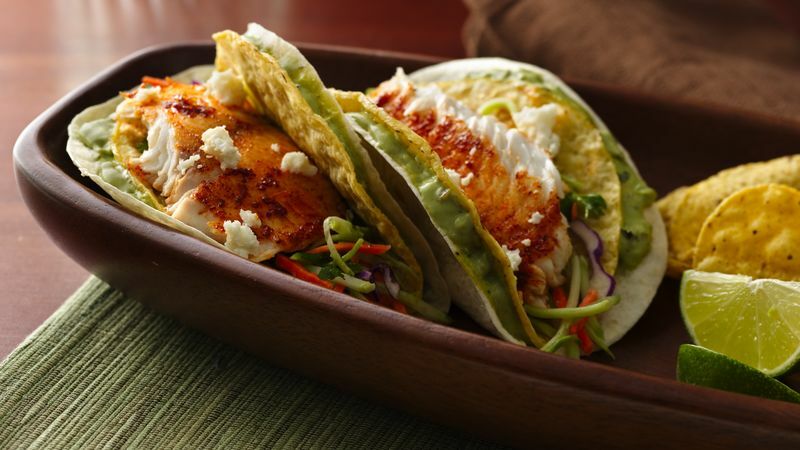 Place 1 fish piece over slaw in each taco shell. Gently fold tortilla sides up to match taco shell sides. Top with 1 tablespoon cheese. Substitute refried black beans for the guacamole. To make filling the tacos extra easy, try Old El Paso® Stand’n Stuff® Taco Shells.